In memory of WILLIAM McNIDER Ship-Master who died 29 December 1832 aged 63. 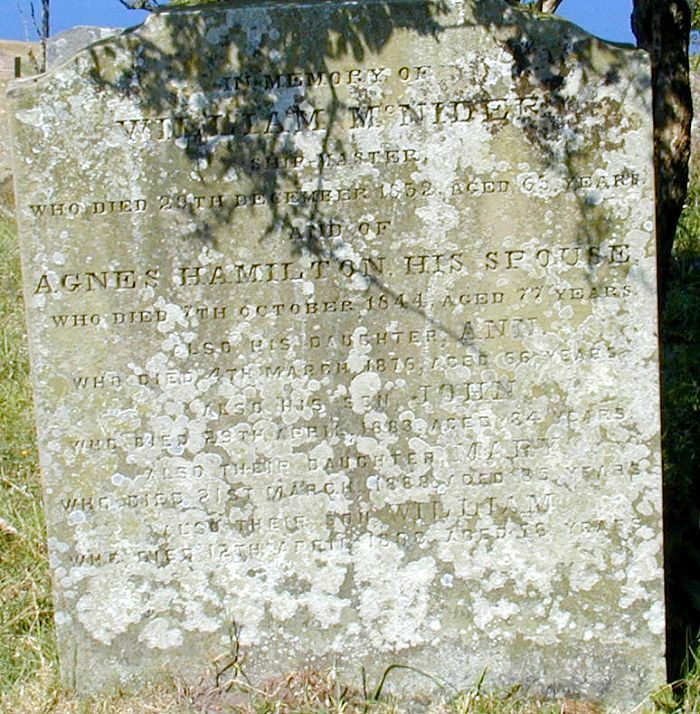 And of AGNES HAMILTON his spouse who died 7 October 1844 aged 77. Also his daughter ANN who died 4 March 1876 aged 66. His son JOHN who died 29 April 1883 aged 84. Also their daughter MARY who died 21 March 1888 aged 85. Also their son WILLIAM died 12 April 1888 aged 78. In memory of WILLIAM McNIDER Ship-Master who died 29 December 1832 aged 63.
their son WILLIAM died 12 April 1888 aged 78. 2 i. John McNIDER was born on April 8, 1797 in Parish of Maybole, Ayrshire.1 He died on April 29, 1883 in Burnside Cottage, Maybole, Ayrshire. 2 He was a Seaman (Merchant Service). He was buried in Kirkbride Churchyard #15. He has reference number Bachelor. 4 iii. Mary McNIDER was born on February 27, 1801 in Parish of Maybole, Ayrshire. 4 She died on March 21, 1888 in Burnside Cottage, Maybole.5 She was a Housekeeper. She was buried in Kirkbride Churchyard #15. She has reference number Spinster. 5 iv. 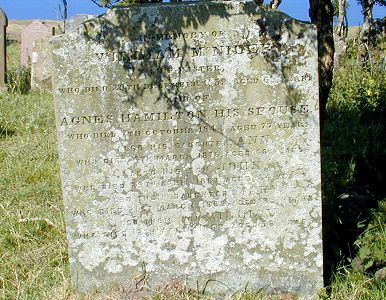 Anne McNIDER was born on November 29, 1803 in Parish of Maybole, Ayrshire. 6 She died on March 4, 1876. She was buried in Kirkbride Churchyard #15. 6 v. William McNIDER was born on January 20, 1810 in Parish of Maybole, Ayrshire. 7 He died on April 12, 1888 in Burnside Cottage, Maybole, Ayrshire. 8 He was a Wright/Master Joiner. He was buried in Kirkbride Churchyard #15. He has reference number Bachelor. William's neice Agnes McNIDER aged 33 is staying with him in 1881. 2. Death Cerificate #52 of 1883 at Maybole, Ayrshire. 5. Death Cerificate #18 of 1888 at Maybole, Ayrshire;. Informant on Certificate - Peter Rutlidge, acquantance, Drumshang, Maybole.